The typical Indian classroom – once characterized by students sitting through hour-long lectures – are now abuzz with tablets, a new trend of personalized learning. Elets News Network finds out if technology is really improving the level of education in our country and can it ever replace a real teacher? The advanced technology is changing how the young India is applying geometric formulas or balancing chemical equations. Some of the best minds in the education sector believe that the usage of tablets in classroom is necessary as we prepare our students for the global economy. Our Indian classroom is undergoing a sea change, and blackboard and chalk may not be its most important features anymore. The ‘digital native’ generation is more comfortable with receiving homework alerts and sharing notes on their tablets. Technology makes the process of learning more exciting, interacting and engaging, says Neeta Bali, Head of Kasiga School, Dehradun. “There is a dire need to integrate technology into education to make it meaningful, easy to assimilate and lasting in impact. If used judiciously, it can be a great tool. Tablets open out new vistas of global learning, if used judiciously in a supervised environment, particularly with younger students. It is wise to use a tablet of good brands that are child friendly, easy-touse and breakage resistant,” she adds. Echoing the same sentiments, R.K. Sharma, Principal, Satyug Darshan Vidyalaya, Faridabad, insists that in this era of advanced technology the students need to be tech-savvy. “Fashion of buying new books every year is a wastage and threat to greenery and ecosystem. Tablets save paper as well as teacher’s time, and help the child to understand the concepts and apply these in real life situations. It helps the students to immediately connect with the teachers and peer groups for solution to their problems. In modern education system learning by doing is required, so tablets become one of the sources. Immediate problems can be detected, solutions can be provided and reminders can be given through the tablets,” he adds. The whole process encourages students to not just mug up the theories but actually understand the concepts of mathematics, physics, chemistry and other subjects. The tablets not just open up new opportunities of teaching but also help students share what they have learnt. Many schools are recognizing the potential of usage of tablets in classrooms. Although most of the educators agree that the traditional tools of teaching are slowly losing their relevance, the path to usage of technology in classroom needs to be treaded carefully. It is true that older generations relied more on traditional tools of teaching but the generation Z, whom we also know as the Alpha generation learners or Digital Natives, is more receptive to digital learning tools and techniques. “Still, there are many parameters to check and keep in mind while selecting a tool for school. First and foremost the base of the product, the theory or foundation on which the product was formed. The benefit it will do to the community, what research has gone behind developing this product, training support, installation costs, post sale services, customer satisfaction, relationship building and monitoring, repairs or warranties applicable, grievance redressal, applications offered, durability, price, etc have to be crosschecked. When deciding on a product for young kids, schools need to be sure that there are no harmful or ill effects on the health of the kids,” shares Dr Niyati Chitkara, Principal, Chitkara International School, Chandigarh. Every teaching and learning tool has its own advantages and disadvantages. And tablets are no exceptions. Though more and more students are comfortable using advanced technology there’s still a small fraction of students who find the sensitive and human touch of a real teacher necessary to stay motivated. Therefore, a balanced mix of both could be the ideal way to help our students stay interested in their studies. “ D i g i t a l tools and traditional tools are not contradictory. They are rather supportive to each other. Tablet is n o t the only way; it is an additional and important tool to help the students understand the concepts better. Traditional teaching can be enriched with digital tools for effective teaching and learning. In traditional teaching, students rarely participate in the process of teaching and learning. Whereas in digital learning students’ participation is paramount. No e-device can possibly be a substitute for a real teacher, who brings human touch to the process of learning. A real teacher can motivate and guide students in a way a tablet never can. While adopting technology we need to remember that technology doesn’t teach, teachers do,” says R.K. Jain, Principal, Dr D Y Patil Institute of Engineering and Technology, Maharashtra. Schools today put a lot of emphasis on activity based and experimental teaching methods. The learning process is different for every child and this interactive technology only makes the learning more engaging and memorable. Tablet also bridges the gap for students who find it hard to catch up with others in the class. The teacher can monitor individual student’s progress and pay attention to those who need additional attention. However, the digital roads to smart education have their own shares of potholes. Infrastructure continues to be the main bottleneck. “The government’s ambitious ‘Digital India’ initiative aims to usher into a holistic digital transformation in our country. To empower this initiative the government needs to subside the cost of digital technology so that educational institutes may invest more on infrastructure to ensure that state-of-the-art facilities are provided to the students. Also, student digital educational aid needs to be supported so that tablets can be made mandatory in all educational institutions,” Says Peeya Sharma, School Head at Ryan International School, Gurgaon. The new government should take more efforts to bridge the digital deficit so that every student gets an equal opportunity to learn and create a better future. 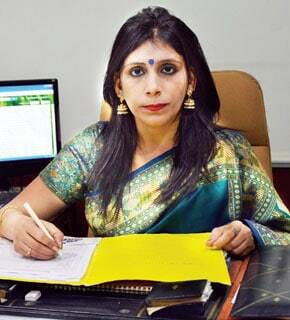 It is necessary to provide the technological skills to each child in the government schools, says Sasmita Mohanty, Principal, Sanjay Ghodawat International School, Kolhapur. “There is a need to provide training, computers and tablets as per the number of the students in every school. Funds should be allocated to all public and government schools to bring technology to grassroot level more aggressively. Private schools can offer to share their resources with the less privileged ones. Also, corporate houses can make this a part of their CSR initiative and take initiatives to provide necessary infrastructure to incorporate technology in government schools,” shares Sasmita. Niyati believes that the government can take a learn from the professor of Educational Technology at the School of Education, Communication and Language Sciences, at Newcastle University, Sugata Mitra’s experiment of the “hole in the wall” wherein he installed old computers in far off villages in walls and left the students to experience and learn from them. “The government should encourage companies to adopt village schools or government schools. More focus and planning is required to make sure the infrastructure provided is used regularly and effectively in government schools. The application part of the process needs to be given due importance,” Niyati explains. While the Massive Open Online Courses (MOOCs) have brought closer the dream of digital equality in our country, the shallow internet density is making a crisis out of an opportunity. “Digital technology has the potential to improve the level of education in India but this dream can only take shape into reality if the infrastructure is placed judiciously. The government should provide 3G/4G internet services not only in metros but in other rural places as well. Spreading awareness on the same could encourage companies and institutions, universities and colleges across the country to develop MOOCs. The government needs to come up with stringent policy to be followed and promote more online courses. More faster and extensive access to internet all over the country is of the utmost importance. Dedicated lease line of internet facility can be provided as an outreach program to all the university, colleges and school throughout various states,” suggests Sasmita Mohanty. Tablet in education can boost student learning and revolutionize our classrooms. It enhances creativity, keeps the whole process of leaning exciting, imbibes the quality of sharing and helping among students and ensures that students are prepared to meet the demands of the highly competitive modern world. Smart usage of technology will definitely further enhance the education system in India and help creating global citizens.